Looking to hire a veteran? Vets 4212 Federal Contractor Reporting. Contractors and subcontractors who enter into, or modify a contract or subcontract with the federal government, and whose contract meets the criteria set forth in the above legislation/regulations, are required to report annually on their affirmative action efforts in employing veterans. VETS has a legislative requirement to collect, and make available to OFCCP, reported data contained on the VETS-4212 report for compliance enforcement. Learn more. VETS provides information regarding the Veterans’ Preference, veterans’ employment rights and policies concerning veterans and transitioning service members. 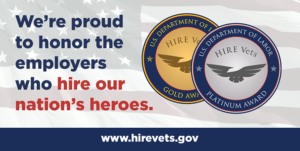 Learn more about the HIRE Vets Medallion Program that will recognize employers who recruit, retain, and employ veterans, and who offer charitable services in support of the veteran community.